From relaxing seaside retreats to beautiful country inns, New Jersey offers many romantic places to stay. Plan a summer weekend trip to relax and rejuvenate at one of these unique properties which offer comfortable accommodations, attentive service and easy access to fun attractions in the area. 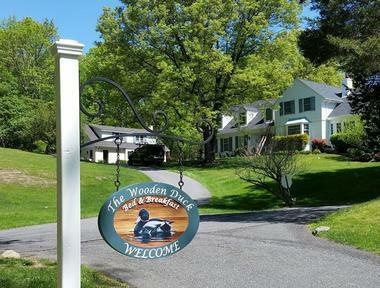 The Wooden Duck Inn is a sprawling bed and breakfast in rural Sussex County. The Estate House has seven beautifully furnished rooms, while the Carriage House contains three luxurious guest suites. Private bathrooms, free Wi-Fi, and flat screen TVs are found in each room. Guests can unwind in the common area of the Estate House, which is outfitted with a large romantic fireplace and plush couches. The Den room has a big screen TV with plenty of games and movies for visitors to enjoy. For entertainment outside of the inn, guests can head into town; antique shops, areas for horseback riding, ski resorts, and golf courses are just a short drive away from the Wooden Duck Inn. At the Gables, guests are treated to luxurious accommodations as well as delicious food. The Victorian-era home that houses the inn was recently restored to its former glory, and the rooms contain ornate furniture and beautiful artwork. Each of the rooms has a spacious marble bathroom, a large flat screen TV, and access to high-speed Wi-Fi. Guests receive a hearty breakfast prepared in the restaurant at the Gables, an upscale venue with meals that consistently rank among the best-tasting dishes in New Jersey. Close to the beaches of the Atlantic shore as well as fine dining and boutique shopping, the Sand Castle is a well-appointed and ideally located bed and breakfast. The bay-front inn offers guests the choice of six uniquely designed and appointed rooms or two luxury suites. Each accommodation includes access to a charming rooftop patio as well as a sun porch, an outdoor swimming pool, and a Jacuzzi. Also included are complimentary bicycles, beach gear, and a game room. Breakfast is served in the dining room and includes fresh fruits, baked goods, and hot, individually prepared entrees. Several specialty packages are offered for special occasions. Housed in a restored turn-of-the-century building, the Island Guest House has space for individual travelers as well as large families. Its prime location offers guests convenient access to a water park, an amusement park, a golf course, nightlife, restaurants, and the beach. The first thing guests notice about the Spring Lake Inn is the front porch. This 16-room European style inn boasts a beautiful 80-foot front porch where guests can idle away the hours. The inn is located one block from the ocean and two blocks from the boardwalk, and its location is a prime draw of this comfortable, quiet, and convenient inn. All rooms are spacious and include a private, luxurious bathroom. A hot, freshly-prepared breakfast is included in the rate and is served in the formal dining room. The innkeepers also provide afternoon tea. Extra touches include complimentary beach chairs, towels, and outdoor showers. 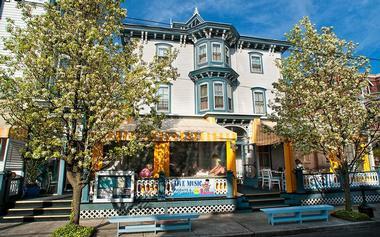 Located in Vernon, New Jersey, the Alpine Haus is a quaint bed and breakfast situated in two Victorian-style homes. One of the homes contains eight guest rooms, while the other home, known as the Carriage House, contains two suites. All of the rooms come with a private bathroom, high-speed Wi-Fi, and cable TV. The suites have special extras including a Jacuzzi tub and space for a couple's massage. Guests have endless options for staying entertained during their stay. Skydiving, skiing, fruit-picking, horseback riding, and hiking are just a few of the activities in the area that visitors enjoy most. 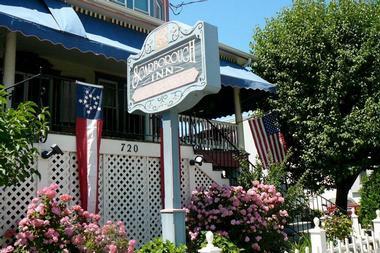 The Sea Spray Inn originally operated as a boardinghouse when it was built in 1872. 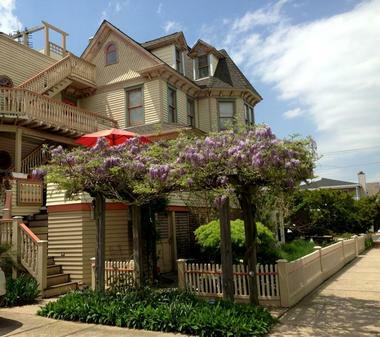 Now, this popular inn has earned the title of Ocean Grove's Top-Rated B&B for its beautiful setting, comfortable rooms, and professional staff. The inn consists of seven original bedrooms decorated with Victorian-era pieces. Each room has its own private bathroom, high-end amenities, and large windows that look out over gorgeous ocean view. Guests get to enjoy a hearty homemade breakfast that is served fresh each morning. In the town of Ocean Grove, visitors can stay busy by shopping, walking along the boardwalk, or exploring local Victorian homes. For faster-paced fun, New York City and Philadelphia are only an hour drive away. Carisbrooke Inn is located just steps away from the beach and the world-famous boardwalk in Atlantic City. It is a popular accommodation choice among honeymooners, business travelers, and solo travelers alike. The inn has 17 large rooms that are split between two beachside cottages. The rooms are decorated with elements of French and English architecture, and guests can choose between a king-size bed, a queen-size bed, or two twin beds. Amenities include a private bathroom, onsite parking, a homemade breakfast, and evening wine and refreshments. Guests can entertain themselves by relaxing on the beach or visiting the casinos in Atlantic City. More ideas: 14 Best Things to Do in Atlantic City. 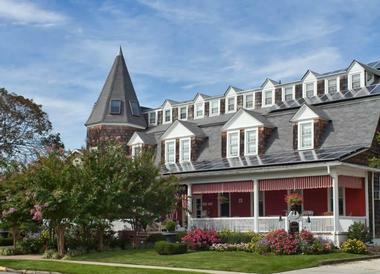 Beauclaire's is a Victorian-era B&B that is just moments away from Cape May's pristine beaches. Located in the city's historic center, Beauclaire's boasts spacious guestrooms with ocean views, built-in fireplaces, and large ensuite bathrooms. Amenities at the B&B include free Wi-Fi, daily homemade breakfast, onsite parking, and a wraparound porch that faces the Atlantic Ocean. For entertainment, visitors should keep an eye out for Cape May's unique events. Sherlock Holmes Weekend, the Cape May Craft Beer and Crab Festival, and Victorian Weekend are just a few of the town's special celebrations. 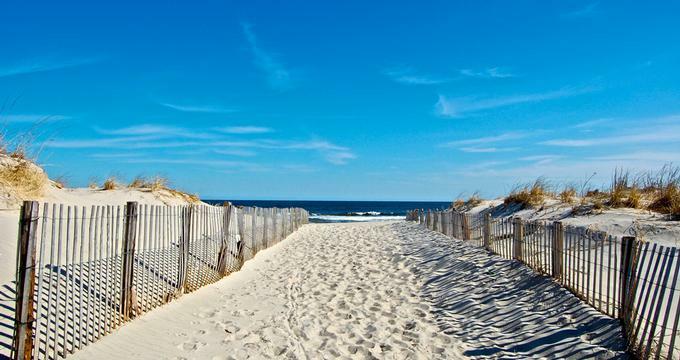 More ideas: 25 Best Things to Do in Cape May, New Jersey. The Beacon House Inn is just a block away from the beach in Sea Girt. It is a classic Victorian-style inn where guests can enjoy all the comforts of home while relaxing in a beautiful and intimate environment. The inn has 21 large guest rooms that come fitted with all the latest amenities. A landscaped garden and pool area are the perfect spots for guests to unwind after a day of sightseeing. The inn also has a wraparound porch lined with wicker chairs that face out toward the ocean. With its beachside location, the Beacon House Inn is suitable for family gatherings and corporate events. Situated high on a bluff, the Sea Scape Manor provides unobstructed views of the vast Atlantic Ocean. The manor has four guest bedrooms, and each has its own unique features. A 15-foot wall of windows, handmade Amish furniture, a walk-in closet, and a spacious balcony are a sampling of the details in some of the Manor's guestrooms. 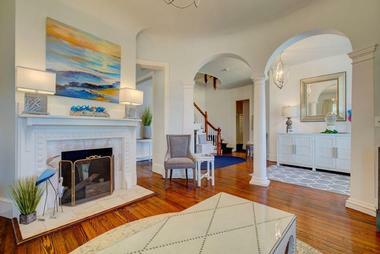 Although the location of the Sea Scape Manor lends itself to solitude, the bright lights of Broadway, the Yankees stadium, and the Statue of Liberty are just a 35-minute-long ferry ride away. For visitors who want to remain in town, it's easy to stay entertained with the area's restaurants, beaches, and hiking trails. 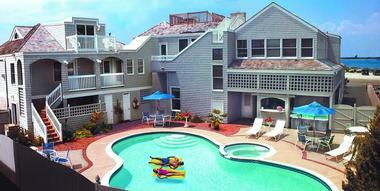 For more than 25 years this Victorian-style inn has been one of Ocean City's most popular accommodation options. The inn has seven rooms as well as a common area, a billiards room, and a dining room. Each guestroom has air conditioning, cable TV, and a private bathroom. The inn provides guests with free daily bike rentals so that guests are able to get around town. At the end of a full day of sightseeing, visitors can relax on the Northwood Inn's spacious rooftop deck. Northwood Inn is open for guests year-round. Victorian Lace Inn is the perfect spot for a romantic getaway or a retreat with friends. The inn boasts Victorian-style rooms that are filled with modern amenities and include ensuite bathrooms. Guests can enjoy a full, hot breakfast each morning on a veranda that overlooks the beach. For entertainment, Victorian Lace Inn organizes fishing trips, whale-watching adventures, and parasailing excursions. In nearby Cape May, visitors can explore museums, gardens, wineries, and historic shops. The inn also has several dog-friendly rooms for guests who don't want to leave their furry friends at home. 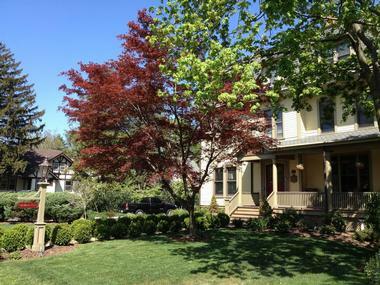 Located on 17 acres of rolling hills, the RoseMary Inn is a recently renovated bed & breakfast in Northern New Jersey. All of the inn's five bedrooms come with spacious private bathrooms, high-speed Wi-Fi, and a flat screen television. A fresh three-course breakfast is served every morning along with complimentary refreshments in the afternoon. There are plenty of options for staying busy since the Appalachian Trail, the Lakota Wolf Preserve, and the Delaware River National Recreation Area are all nearby. Hiking, biking, canoeing, and bird-watching are the most common hobbies enjoyed by RoseMary Inn guests. This 20-room villa has been catering to guests for 120 years. The Carroll Villa Hotel is located within walking distance of the gorgeous sandy beach and the quaint downtown of Cape May. It is the perfect place for families who enjoy walking and exploring. Room choices include king, queen, or full rooms as well as suites. The hotel also houses the Mad Batter and the Blue Batter Bar, an award winning restaurant and bar that specialize in Atlantic coast seafood. Breakfast at the restaurant is included in the room rate, and a 30% discount is offered on dinner. Free parking and Wi-Fi are also available. 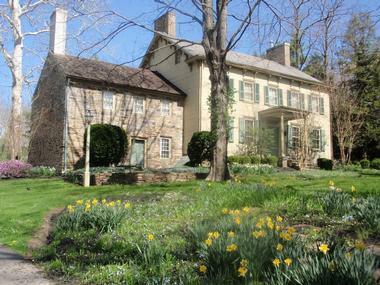 This beautiful estate home and barn were built in the early 1800’s. Modern renovations have allowed visitors to enjoy the charm and grace of a bygone era while enjoying the conveniences and luxuries of present day. Guests choose from twelve available rooms in the estate house or five suites in the renovated barn. The beautiful and historic grounds provide a relaxing external environment, while many guests find the Stone Room common area in the bed and breakfast to be a perfect place for a respite. A hot, freshly prepared breakfast is included, as is access to a “Butler’s Pantry” with homemade ice tea, lemonade, and baked goods. 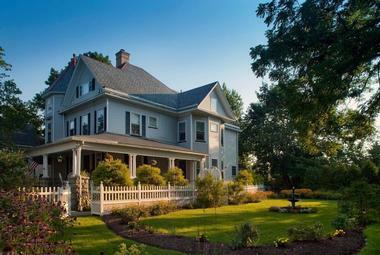 A visit to this 10-room bed and breakfast gives guests the chance to experience life in a large Victorian home. Each room is uniquely decorated in period appropriate décor, and all rooms have private bathrooms. In-room amenities in some rooms include jetted tubs and electric fireplaces. Breakfast is a featured experience at the Candlelight and includes fresh fruit, baked goods and guests’ choice of a sweet or savory main entrée. At five o’clock, fresh homemade cookies and complimentary wine are available. Though guests might be reluctant to leave the comfort and coziness of the inn, the beach is a mere three blocks away. The Inn at Glencairn is an enchanting historic structure situated in a bucolic environment. Built in the 1700’s, the inn is replete with charm and elegance, as well as a great deal of romantic history. Guests are able to choose from one of six large and luxurious rooms. The Hearth Room is available as a common sitting room where guests are welcome make use of the library or the variety of board games. Breakfast is included, and the innkeepers also provide extra goodies such as seasoned pretzels, homemade cookies, and wine. Downtown Princeton shopping and restaurants are easily accessible from the inn. This charming B & B is tucked away in the quiet hills of Sussex County in the quaint town of Stanhope. The large, old house has been meticulously maintained and is now beautifully furnished in a comfortable combination of vintage and contemporary styles. Guests may choose from five rooms and four suites, all with king or queen sized beds and private baths. Step back in time with a stay at this lovely property just thirty-five miles away from New York City. 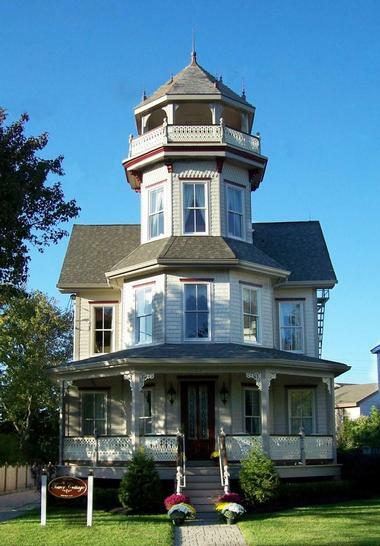 This beautiful bed and breakfast is a restored 1800’s Inn located strategically one block from Summit's downtown. The DeBary is within walking distance of independently owned shops and chef-owned restaurants. Equally convenient is the train station, which allows patrons to take a short trip into or out of the city. All fifteen rooms come stocked with old world charm and modern amenities, including private baths and fireplaces. Complimentary breakfast, cookies, coffee, and wine are part of the exquisite service for which the DeBary is known. Come Wright Inn is located minutes away from Atlantic City, a lively seaside tourist destination. The inn has six guest suites that combine the comfort of modern amenities with the appeal of classic charm. Each morning, guests can enjoy a four-course breakfast prepared by the inn's chef. Come Wright Inn is especially popular among couples because of its package deals. The owners of the inn are pastors who have performed scores of beachside weddings for guests over the years, and they offer deals for couples that include a wedding ceremony, a reception, and a honeymoon all-in-one. The inn also has a garden area that can be used as a reception space or as a venue for renewing wedding vows. Main Street Manor has five guest bedrooms that come fitted with all the comforts of home. A luxurious featherbed, a spacious bathroom, a flat screen TV, and wireless Internet access represent just a handful of the amenities guests will enjoy during their stay. The inn serves a daily two-course breakfast as well as afternoon tea or coffee. For entertainment, visitors can explore the historic town of Fleming on foot. Eight other notable towns and cities are within driving distance of the manor. The manor is also a top choice for weddings because of its beautiful decorations and intimate ambiance. 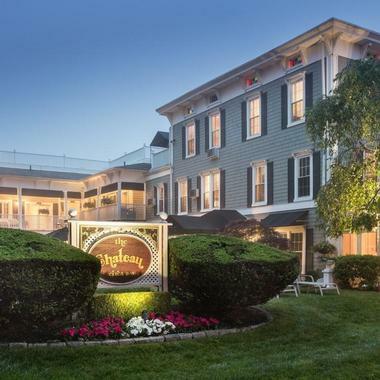 Located two blocks from the famous Ocean City beach and boardwalk, the Scarborough Inn is a bright, lovely, and quiet place where you can take advantage of everything Ocean City has to offer. 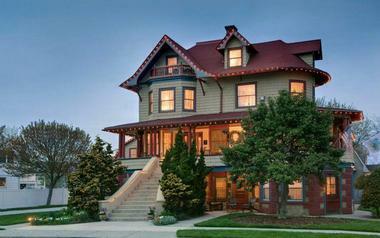 Since opening its doors in 1895, this inn has been family owned and operated. Currently it offers more than twenty rooms and suites for guests to choose from. The included breakfast is served restaurant style and may feature entrees such as Basil Breakfast Strata or Cinnamon French Toast Bake. The innkeepers also provide an afternoon snack in the cozy Sojourn room where guests will find a variety of board games, music, and a library.